Never Screen a Dryer Vent! Beware Screens Over Dryer Vents! The good news with most of these is that the screens usually snap right off, and if yours looks like this, I highly recommend you go remove the screen from yours ASAP. The short version: never put any type of screen over your dryer vent! I’m seeing more screened hoods on the market than ever before, and manufacturers need to be informed that this is a big mistake. Even though I still see it occasionally, most everyone realizes attaching pantyhose to a dryer vent is a fire, or at least a dryer service call, waiting to happen. It seems incredible that a 3/8 inch mesh screen can possibly clog with dryer lint, but I see it happen on a regular basis. Common symptoms include poor drying and long dry times, and a dryer that burns out its thermal fuses and/or elements regularly. If your dryer exhibits any of these symptoms, the first thing you do is run it on 'no heat', empty and with a clean lint filter, and check the airflow outside. As we’ve discussed before, airflow is much more important than heat in the drying process. If your vent hood's very old, or its screen is one of those that's hard to remove, replace it with a louvered type hood. You'll get improved airflow, better sealing, a cleaner appearance, and fewer critters in the bargain. 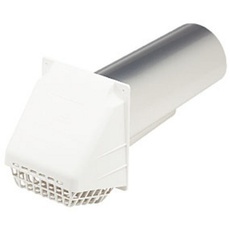 The louvered hoods don’t appear to attract cavity-nesters at all. this page to help me keep this information free! in its entirety, including this message.